Test crckiet is having a good run these days. Earlier, it was Sri Lanka and Pakistan and now it is Australia and England in Ashes. The last 2 tests were an absolute pleasure for any cricket fan. Though I have not been able to watch any games but I am following them very closely. Its really so nice to see some test cricket. After IPL and T20 world cup, cricket was looking boring. T20 is mostly about mind less hard hitting. It is just good in small doses because after some times, all the matches looks more or less same. But it just took a week of great test cricket to bring back the lost excitement. Test cricket is just so beautiful and elegant. 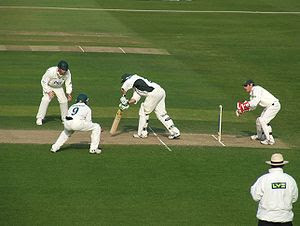 Those jam packed slip cordons for the fast bowlers with edges coming there every now and then, all those close fielders for the spinners eagerly waiting for an inside edge, the straight drives against fast bowlers and square cut against spinners are just a treat. And when its Ashes, its really an icing on the cake. All these years with the exception of 2005 Ashes series, Australia has mostly dominated the matches. But it is still so delightful to watch the matches. I especially love the way English men watch their cricket. Coming early in the morning with an umbrell, beer and a newspaper and having a nap sometimes in between. The first match though ended with a thrilling finish was mostly one sided. I hope that the coming matches are bit more close. I agree with you and in fact love watching test cricket more than any other form of cricket. I thank Aussies for it and the great series of India-Australia in 2001. The Aussies, esp. the Steve Waugh team should be given credit for making test matches more enjoyable with some 4-day finishes and of course the run rate >4 by Haydos and Langer followed by Ponting. However, I still get bored by matches on some of belters in India and Pakistan where even 10 days seem less to decide a match.